the Vice President of India receiving the monogram of his name from Sz. Abdul Moid Khan- the Director, Maapri Tonk. 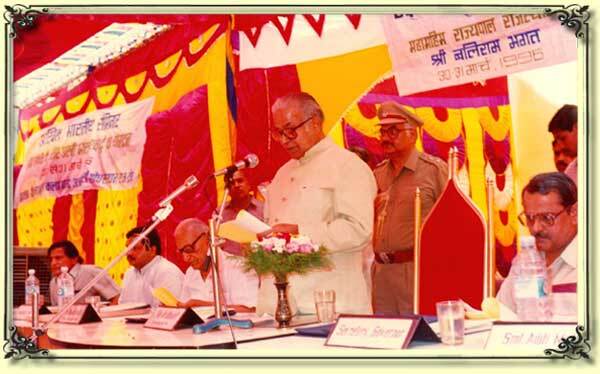 The Government of Rajasthan established this Institute on 4th December, 1978. The Institute, is now completing its 35 years and has obtained the standard of an internationally known Institute. Besides it the learned persons and scholars from home and abroad often visit this Institute to be benefitted and to complete their research pursuits by the source material the Institute provides. The three veteran scholars of this Institute have been honoured by getting President award first Shri Sahibzadah Shaukat Ali Khan the ex- Director of this Institute in the year 1992 , secondly Shri Maulana Mohd. Abdul Hai Faiz in the year 2001 specially for their contribution of literary works pertaining to the material kept in this Institute and thirdly LateDr.M.Riyazuddin Khan in the year 2005.Acalligraphist of this Institute Shri Khursheed Alam has got the opportunity to participate in the international Koranic calligraphy exhibition organised in Iran. 01.The help to researchers: The Institute provides the xeroxed copy ofwanted material of research to the researchers and scholars. Many home scholars from Andhra Pradesh, Delhi, Maharashtra, Rajasthan, Uttar Pradesh, Bihar etc. and foreign researchers from America, England, Japan, Germany, Egypt, Israel, Australia, Iran,Afghanistan etc. have already been benefitted in doing their research. The 52 scholars, benefitted by the source materials preserved here, have received Ph.D. degree by the different universities while 13 research scholars are getting advantage. 02. Correspondencial help: To provide the scholars their wanting research material by correspondence also is the permanent and important activity of the Institute. 03. Publications:In such a short span of time the Institute has released 108 publications e.g. 12 Catalogues, 27 Research Journals, 20 translationworks and 49 other publications out ofwhich there are 10 ofHindi, 14 of English, 66 ofUrdu, 3 ofArabic 6 of Persian and 9multilingual. 04. Survey: Since the installation the Institute after launching survey campaigns conserves presently 8,658 manuscripts, 32,129 reference books, 17,980 old magazines, 722 royal edicts and except of 65000 files of the verdicts of Shariat record of erstwhile princely State of Tonk, thousands of invaluable documents, certificates, monograms (Tughras) and panels also. 05.Dar ur-Rasail : Just to accumulate the oldmagazines in the year 1996 a separate cell was installed named Dar-ur-Rasail. It contains 17,980 old magazines pertaining to 570 sorts. Recently the Institute got a very important collection from the late Chand Bihari Lal Saba's personal library including 1971 magazines. Being inspired by this donation the successors of Shri Manzoor Alam Sb.- Advocate, donated some more reference books with two almirahs to this Institute. 06.Handlists: The handlisting and cataloguing work of Arabic, Persian and Urdu manuscripts in Hindi, Urdu and English for the facility of learned persons and scholars for ready reference is in progress. 07. Scholarship/Fellowship : Under the scheme of Nawwab Mohd. Ali Khan Fellowship, the Institute provides two fellowships of Rs. 1,800/- per month (each) and under the scheme of Nawwab Amir ud-Daulah Scholarship 4 scholarships worth Rs. 400/- per month (each) to those scholars, registered in any university established by law in India or traditional scholars, who do their researchworks based on the sourcematerial preserved in this Institute. H.E. 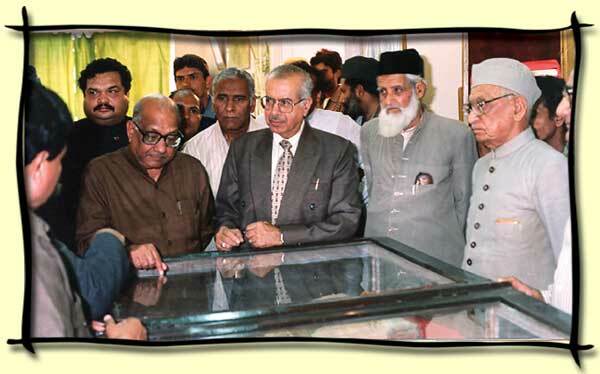 Anshuman Singh - the then Governor of Rajasthan receiving a calligraphic panel from Sz. Abdul Moid Khan, the Director, hon'ble Banwari Lal Bairwa - the then Social & Welfare Minister of Rajasthan explaining the importance of the panel. 08. Manuscriptalogy: With the approval of the Government of Rajasthan a one year DiplomaCourse of Manuscriptalogy is running from 1998-1999 in the Institute inwhich ten students are given admission and each student out of the 10 selected is paid Rs. 500/- per month as an honorarium. As presently there is a lack ofArabic, Persian and Urdu scholars. Hence the Arabic, Persian and Urdu record kept in G.A.D., Secretariate, Rajasthan State Archives, Bikaner, Rajasthan Oriental Research Institute, Jodhpur, and Department of Archaeology and Museum, Rajasthan, Jaipur or in any private offices museums and GovernmentOffice keeping such records in the shape of documents,Tamra Patras,Kharitas, Faramin, Certificates and written matter on old coins, swords, shields and utensils etc. need Arabic, Persian and Urdu hand people to get such records deciphered otherwise the scholars will be deprived of the usefulness of this record. Noticing the necessity of such workers availability the Institute is running this class so that such vacant posts of the departments, stated abovemay be filled up. 09. Seminars and Extension Lectures: The Institute is continuing to organise seminars and extension lectures in which except of literary subjects the seminars were held on national topic also asNational Integration and harmony. 10. Participation in the Book Fairs: The Institute participated in national and international book fairs etc. held respectively in New Delhi, Bhopal Jalandhar, Mumbai, Vijayvada, Patna, Shri Nagar, Lucknow, Jaipur, Bangalore etc. and demonstrated the Institute's publication also and sold.As far as the achievements of the Institute are concerned, the news papers of the concerning states gave spontaneous flashes in suchwords "In IndiawhereUrdu is on the edge of decay the Government of Rajasthan, in the desert of Rajasthan introduced an oasis by establishing the Directorate of Arabic and Persian languages and literature in Tonk, deserves to be congratulated". 11.Organisation of Exhibitions : An exhibition was opened on the eve of theGolden Jubilee of India's freedom and another exhibition was demonstrated on the eve of the Golden Jubilee celebrations of the formation ofRajasthanwhich continued forwhole of the year and independent of this there were organised so many timely exhibitions providing the comprehensibility of the symbolic and signifying presentation of the achievements, aims and objectives of the Institute to the visitors. The ex-Chief Justice and ex -Governor of Rajasthan- Hon'ble L.N. 12. JhankiDemonstration: Every year on the eve of 26th January, theRepublicDay, the demonstration of a beautiful Jhanki is also a permanent item of the Institute's activities which always earns acclaim and applause generally and often wins a First District Level Prize also. The Institute also participated in the programme of state level tableau demonstration held at Jaipur and elevated the image of distt.Tonk. 13.NawwabMuhammadAli Khan ArtGallery: In the year 2003 the provision of a newattractive and beautifulArtGallery is also added to the prominent activities of the Institute.Aresearch expeditionwas steered to reassemble the disbursed and scattered artifacts-the mementos of the past pertaining to the erstwhile princely state of Tonk for their 12. JhankiDemonstration:- 13.NawwabMuhammadAli Khan ArtGallery:- concentration to display . This section contains the representations of the art pieces of old and beautiful calligraphy, the art designed on Namda, photography, the collection of some old and late stamps of India and of many foreign countries, the calligraphic art designed on human hair, lentil bean, sesame and on rice, the art of calligraphy and decorative calligraphy written and designed inside the bottle made of a transparent glass, the collection of some old coins.These representations capture the eye of any visitor. 14. Display Hall: The provision of a Display Hall is undoubtedly a boon since the very inception of the Institute just to display safely the very important and rare manuscripts so that the special visitors, learned persons and scholars maywatch this invaluable collection. Themanuscripts are artistically embellished with gold, enamel and lapislazuli work. Some of them are having imperial seals, autographs and hand writings of some veteran scholars also. 15.GuestHouse: As a further landmark the RajasthanGovernment constructed a scholars Guest House adjacent to the Directorate's new building to provide lodging facilities and amenities to the research scholars on subsidized rates. 16. Binding, Lamination and Fumigation : As a result of survey, the lamination, fumigation and binding work, of the fragile and tattering books, manuscripts and magazines received in donation, is done with chemical treatment for the long life, safety and the study of the researchers. 17. Graphic Designs: Under the scheme of Graphic designing, sponsored by National Council for Promotion of Urdu Language, Ministry of Human Resource Development, Government of India, 25 students get their one year training of Urdu Calligraphy and graphic designing course per year.The provision of this training has been started since 2001. 18. One Year ComputerDiploma Course: 80 students are given admission to learn computer applications and Multilingual (DTP) Urdu in one year diploma course as this scheme is sponsored by NCPULNew Delhi. This scheme is running from the year 1999-2000. Presently the 15th batch is under training. Having done this course, 610 students have got the diploma. Numbering more than half of the total number, the students of this co-educational training centre, have already got their jobs in educational institutions and private companies. 19. Functional Arabic Course: Under the scheme of two years functional Arabic Course sponsored by N.C.P.U.L., New Delhi. This scheme is running from the year 2004. Having done this course 225 students are benefitted and 25 students are taking training under this scheme. 20. The Current Planning of the Institute: In the current planning of the Institute the digitizing, computerizing and the construction of BaitulHikmatwork is in progress. 21. The future planning of the Institute: It is a matter of great pleasure that the construction work of "The Tonk Museum" is to be got done in the premises of the Institute costing the expenditure of rupees 7.55 crores, besides it the construction work of a library and cubicles of the scholars is to be done for the facility of the researchers. 22. Prizes and Felicitation Awards : A new scheme of awarding four scholars of Arabic, Persian, Urdu and History @ Rupees 10,000/- each, to accredit their outstanding research works, has been activated from the year 2013-14. The Institute is also aggressive to bring out such highly valuable and unprinted manuscripts that the publication of these manuscripts will highlight the name of the country andwill achieve a goal inArabic, Persian and Urdu world.